Confederacy, 1862, 5¢ blue, Archer & Daly Printing, horizontal pair, full margins, small corner scuff at top right, tied by "Richmond, Va., Dec 20, 1862" cds on Captured Union Patriotic with red and blue belted "USA" emblem with "United We Stand, Divided We Fall." slogan, addressed to Athens, Geo., Very Fine, illustrated in the 1986 Dietz Handbook (page 136). Scott No. 7 Estimate $500 - 750. Confederacy, 1862, 5¢ blue, Archer & Daly printing, horizontal pair, margins full to clear all around, tied by clear "Mobile Ala. Jul. 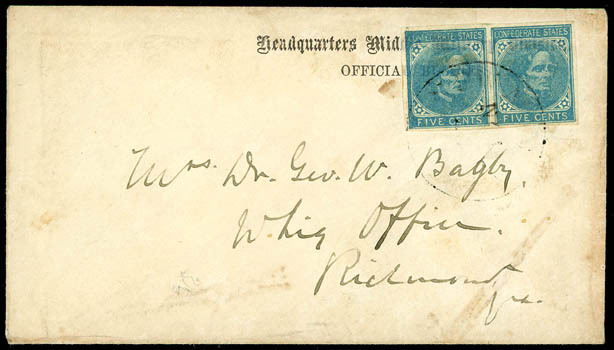 23, 1863" double-circle datestamp on small cover addressed locally, manuscript endorsed "per Senator" at bottom left designating a rare Confederate steamboat use, stamps with faults from being placed over the edge of cover, Fine and rare Confederate steamboat use; signed Green on reverse. This Confederate Alabama River steamboat cover was featured in a 1991 Confederate Philatelist article by Galen Harrison which accompanies. 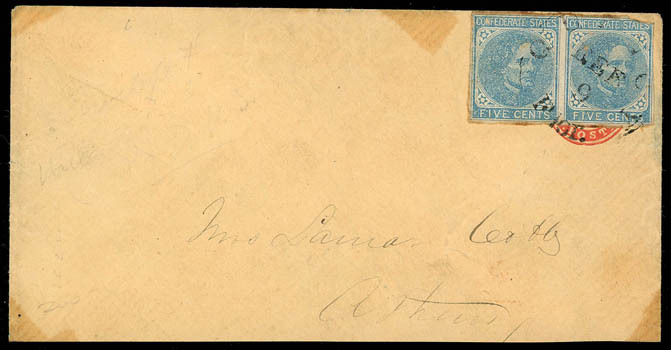 Confederacy, 1862, 5¢ blue, Archer & Daly printing, single tied grid on homemade newspaper wrapper with manuscript "October 3rd '64" date, to Mr. Mitchael Walters in Wytheville Va., F.-V.F., a scarce use overpaying the 2¢ rate, ex-S. Zimmerman. Confederacy, 1862, 5¢ blue, Archer & Daly printing, horizontal pair, four margins with deep color, tied by indistinct cds over printed "Headquarters Middle Military Division, Official Business" imprint on cover to Whig Office at Richmond Va., a Very Fine adversity use. This imprint was not Confederate, but rather Union and is incorrect in both the Dietz and current CSA catalogs. The Union Army operated in the Shenandoah Valley during the Valley Campaign in 1864. 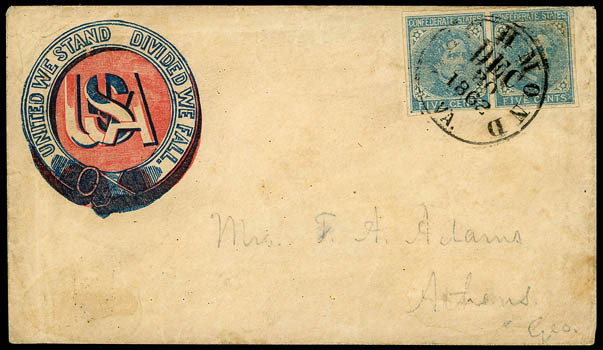 Confederacy, 1862, 5¢ blue, Archer & Daly printing, horizontal pair, margins to in at top right, tied by "Quincy Flor., Sep 9" cds over U.S. 3¢ red (U27) star die entire addressed to Athens Ga.; small stamp flaws, tape stain and reduced at bottom, Fine and rare Florida adversity use of the 3¢ star die. ; with 2004 C.S.A. certificate. Scott No. 7 Estimate $200 - 300. 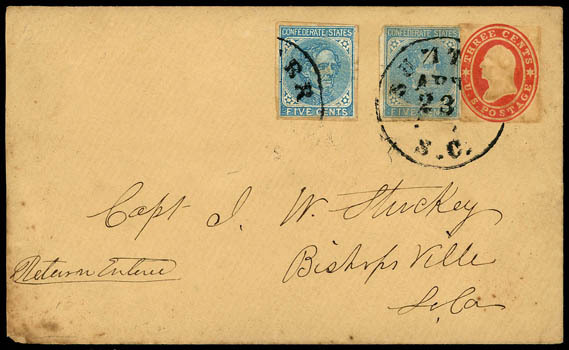 Confederacy, 1862, 5¢ blue, Archer & Daly printing, two singles, on U.S. 3¢ Star Die entire to Bishopsville, S.C. with one stamp affixed over indicia, tied by bold "Sumter, S.C., Apr 23" cds; right stamp removed to showing indicia, Very Fine. Scott No. 7 Estimate $150 - 200. 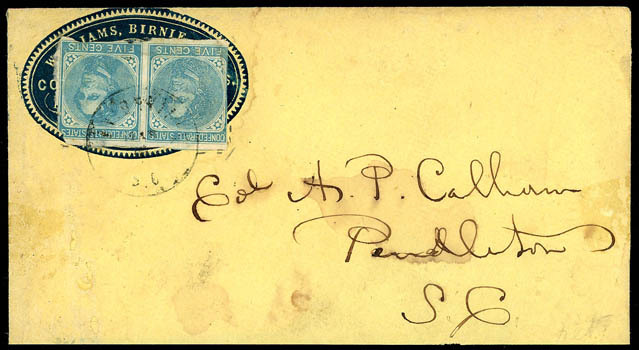 Confederacy, 1862, 5¢ blue, Archer & Daly printing, horizontal pair, tiny flaws, tied indistinct South Carolina cds over blue embossed cameo corner card of "Williams & Birnie & Co. Commission Merchants, Charleston, S.C.", addressed to Col. A. P. Calhoun, Pendleton, S.C. (son of John C. Calhoun); slightly reduced at bottom, erosion holes along left side of face and part bottom flap missing, F.-V.F. Scott No. 7 Estimate $100 - 150. 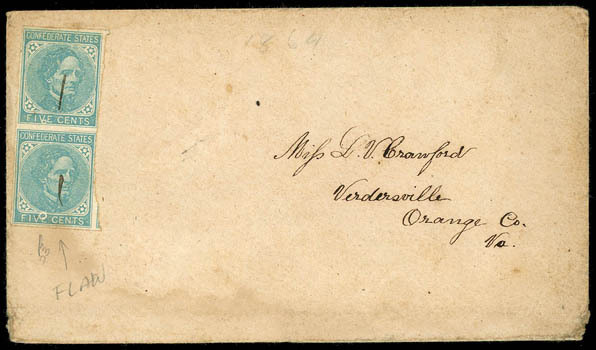 Confederacy, 1862, 5¢ blue, Archer & Daly printing, transient plate flaw in "FIVE", vertical pair, both stamps showing different circular flaws between "VE" in "FIVE", manuscript canceled on cover to Verdersville, Va., no origin townmark; cover edge wear, F.-V.F. 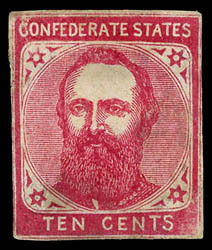 Confederacy, 10¢ red, Stonewall Jackson essay, typograph design on wove, clear margins, Fine, an extremely rare "unissued" design with only three to five examples believed to have survived, accompanied by three Taylor creations of this design in colors (flaws). In 1866-67, one printing of 300 emissions where produced and sold as proofs. 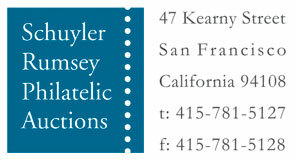 The Dietz catalog states that this stamp was the subject of extensive controversy in the late 19th century. A story from the 1870's claimed that an engraver was commissioned by H. Offutt of the Confederate Post Office to prepare a stamp with the portrait of General Jackson, and was never paid for his work. Offutt denied all claims to this story.